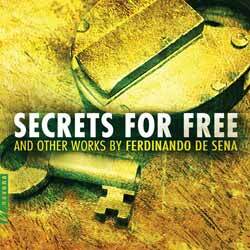 Ferdinando De Sena's new release, Secrets for Free, opens with 'Deciphered Reverencea' (10 min, 10 sec), which manages to mix traditional classical pieces with a classical Hollywood feed. It's a beautiful piece with elements that brought to mind Prokofiev's Romeo and Juliet as well as a Bernard Herrmann-esque cinematic feel. The track previously appeared on Navona's Reason & Reverence which was released earlier this year (2018). The electronic-infused 'Secrets for Free' (6 min, 03 sec) is an acquired taste. It took many listens before I grew to enjoy it. On a first play thorough it's fun and intriguing - as it sounds different to anything you'll have heard before. The easiest way to describe it would be to say that it could easily be playing in the background of the Mos Eisley Cantina. The EP concludes with the three part 'String Quartet No. 1' (11 min, 54 sec), which is a more traditional work, and will easily be embraced by lovers of traditional classical music. It's a wonderfully diverse release that showcase De Sena's versatility as a composer. I wasn't a fan of his Spalding's Bounce and Other Chamber Works (2016) mainly because that album was everything that this album isn't. Secrets for Free is captivating in places and heartbreakingly beautiful in others.